When a Pakistani friend of mine in college introduced me to the little packets of pre-blended seekh kebab spices at our local Indian market, it was something of a revelation. Oh, this is what a balanced spice blend tastes like. That blend had plenty of heat, a good mix of warm spices (I distinctly remember seeing "long pepper" on the ingredients list and wondering what the heck it was), and a hit of acidity in the form of powdered dried mango or papaya. But it wasn't particularly great so much as it was consistent and, more importantly, consistently better than anything else I was cooking at the time. These days, I think we can improve on it a little. A balanced blend of spices adds heat and acidity to the meat mixture. Draining the ground aromatics ensures that excess moisture doesn't destroy the texture of the skewers. Grilling over a two-zone fire gives us optimal control over juiciness and browning. Toast peppercorns, coriander, cumin, and cloves in a dry skillet over medium heat, tossing and shaking frequently, until fragrant, about 1 minute. Transfer to a spice grinder. Add bay leaves and grind to a fine powder. Transfer to the bowl of a food processor. Add paprika, cayenne, salt, amchur, red onion, cilantro, garlic, ginger, chilies, and sugar to bowl of food processor and process until a fine paste has formed, about 30 seconds. Transfer mixture to a double layer of heavy-duty paper towels or a triple layer of cheesecloth. Fold towels over mixture and press gently to start extracting liquid. Lift up towels and form a bundle. Squeeze gently over sink to remove excess liquid. The remaining mixture should be dry enough to crumble when picked up. Combine ground beef or lamb with the spice/aromatic blend and massage with your hands until completely homogeneous and slightly tacky, about 4 minutes. Continue as directed, or, for better texture, let mixture rest, covered, in the refrigerator for several hours or up to 1 day. Divide mixture into 12 even portions of about 3 ounces each. Roll into cylinders about 6 inches long and 3/4 inch wide and thread onto metal or bamboo skewers. Light one chimney full of charcoal. When all charcoal is lit and covered with gray ash, pour out and arrange coals on one side of charcoal grate. Set cooking grate in place, cover grill, and allow to preheat for 5 minutes. Alternatively, set half the burners on a gas grill to the highest heat setting, cover, and preheat for 10 minutes. Clean and oil grilling grate. Working in batches if necessary, place skewers over cooler side of grill, cover, and cook until they are nearly cooked through, about 5 minutes. (If you prefer, you can continue to let them cook through completely on cooler side, for more traditional, color-free results.) 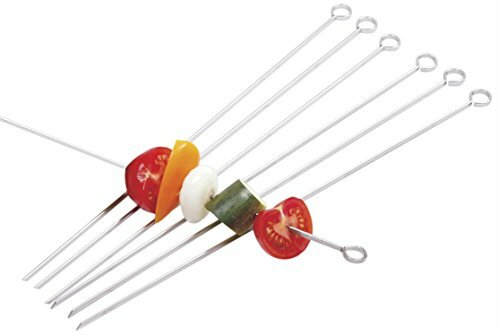 Open grill and transfer skewers to hot side. Continue to cook, turning frequently, until well browned on all sides, a few minutes longer. Transfer to a serving platter and serve immediately with shredded cabbage or Spicy Cabbage and Red Onion Slaw, cucumber, tomatoes, and lime wedges. Amchur is dried-mango powder. It has a very tart flavor and is available from Indian groceries or spice shops. If you can't find it, substitute with 1 teaspoon (4g) citric acid powder, or 2 teaspoons (10ml) tamarind paste, or 2 teaspoons (10ml) lime juice. If using tamarind paste or lime juice, incorporate with the other moist ingredients in step 3.